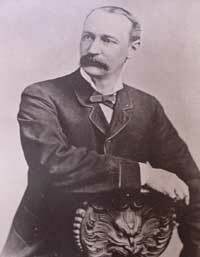 David Moffat was a wealthy Denver businessman who saw the need for a rail link between Denver and Salt Lake City. His vision, a 6.2 mile long tunnel beneath the Continental Divide, made this link possible. He was born in 1839, the youngest of 8 children. He ran away from home at age of 12, went to New York City and found work as a bank messenger. He was an assistant teller by the age of 16 and became a millionaire through real estate by the age of 21. Moffat was admired for his qualities of courage, adaptation to the “barbaric” West and his goodness of heart. He married his childhood sweetheart, Francis Buckhout, moved to Denver, and in 1860 opened a bookstore/stationary/drug store with C.C. & S.W. Woolworth on the corner of 11th and Larimer. Moffat and others formed the Denver Pacific Railroad to reach Cheyenne. 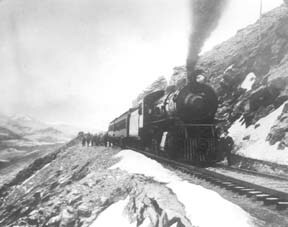 The rail line to the Moffat Tunnel was the highest standard railroad ever built in the U.S. (11,660 ft). 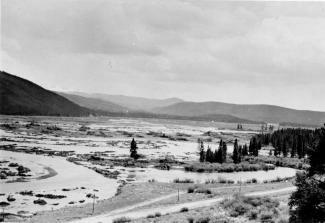 It went over the Continental Divide at Rollins Pass and came into the Fraser Valley in 1904. At the time, it was the most difficult railroad engineering and construction project ever undertaken. It involved boring numerous tunnels through solid granite, as well as constructing precarious timbered trestles that bridged deep mountain gorges. David Moffat was a multi-millionaire when he started the Moffat Line and was nearly broke when he died in 1911 trying to raise money for the tunnel that would eventually be built and bear his name. It was finally completed in 1928. The west portal of the Moffat Tunnel can be seen from the Winter Park Resort. Ellen Elaine Engelhaupt was the first of nine children and was born in Chambers, Neb., on July 13, 1912, to Michael and Ollie Engelhaupt. She attended schools in Sterling and Crook, Colo., driving a pony trap to school when the distance was too far to walk. She graduated from Sterling High School at age 20, as one high school year was spent recovering at home from rheumatic fever. In 1919, she also missed her first grade year recovering from the Spanish Flu. She met James Samuel Crabb, a resident of Crook and they eloped on Jan. 29, 1934. They farmed outside of Crook until 1941 when they joined partnership with Joe Spacek, growing winter wheat at the Company Ranch on the Williams Fork. After building a house in Parshall, Ellen was commissioned in 1948 as Post Master. The Post Office was operated out of the Crabb's house. Being the Post Master, Ellen was in the position to be the contact person for needs and emergencies in the community. As she approached retirement, Ellen worked diligently to obtain another Post Office site in Parshall, which would guarantee continuous service to the town and surrounding community residents' emergencies in the community. Ellen was known for her green thumb and her sewing arts. Throughout the summer months, her yard was in constant bloom and a source of pride for her and her family. She sewed clothes for her daughters, knitted or crocheted gifts for family and friends, and in her retirement years, designed and made quilts as a hobby. She won numerous ribbons for her craft at the Middle Park Fair. She was member of the Williams Fork Demonstration Club, a past Worthy Matron of Eastern Star Starlight Chapter 129, and in retirement worked with Grand County Social Services on behalf of the senior citizens. She worked diligently for low-income senior housing including development of the Silver Spruce Senior Apartments in Kremmling. Ellen and Jim had in common their love of music and dancing. Often at local dances others would step aside to watch Ellen and Jim. They would dance at the Trocadero Ballroom in the old Denver Elitch Gardens where other dancers would also create a circle around them to watch their foxtrot. Ellen and her husband of 58 years, Jim had three daughters: Frances, Leota and Margaret. 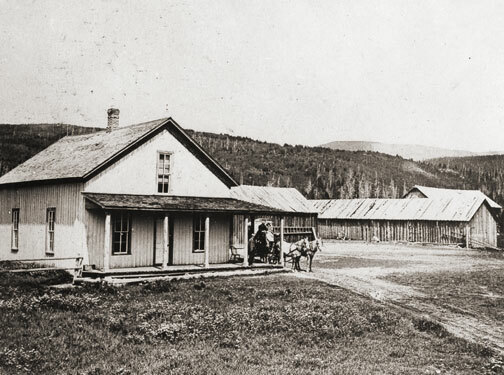 The early emphasis north of Granby was tourism and mining. When the mines were exhausted in the early eighties, some of the locals turned to ranching. 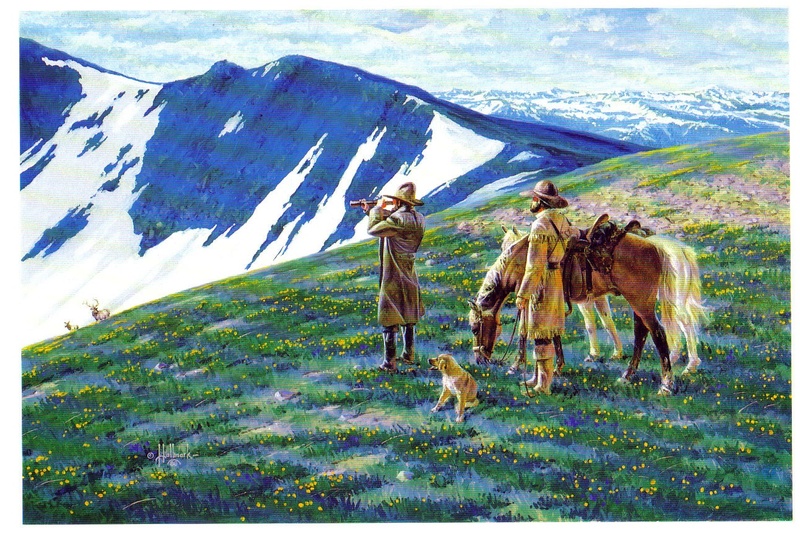 Henry Lehman was one of these ranchers on the upper Grand (Colorado). He homesteaded and built a ranch on the South Fork of the river where the family took in guests, travelers and fishermen. Henry died in 1919 and the ranch was purchased by the Knight family of St. Louis. The first historical reference of Harry Knight was the gift to the Grand Lake Yacht Club of a cup for racing competition known as the Knight Cup. It was one of many coveted trophies sought after the winning of the famous Lipton Cup. Knight's most important place in local history was his friendship with Charles Lindbergh. When Harry Knight was president of the St. Louis Flying Club he developed great respect for the "ace pilot". Lindbergh had pioneered the airmail route between St Louis and Chicago. Because of his skills Knight chose Lindbergh as his personal flight instructor. Harry convinced the head of the St Louis Chamber of Commerce to have them help Charles by sponsoring his famous flight with a check for $15,000. Years passed and Lindbergh became involved with other activities that did not involve the Knights. Water storage became the most important problem facing them. The Granby dam was proposed for construction. After completion of the dam the Knight family auctioned off their house, bunkhouse and ranch equipment on July 27, 1946. 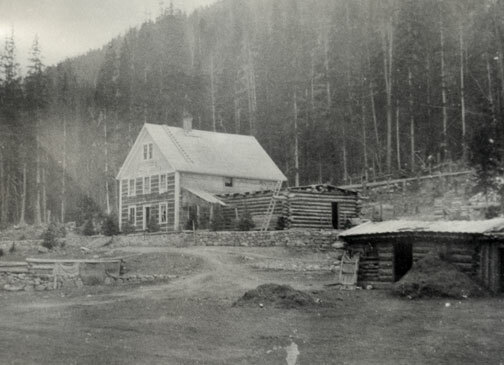 The ranch house was dismantled and moved to a lot overlooking Lake Granby where it is still used as a private residence. Helen Catharine Linke, 90, of Granby, Colo., passed away quietly at the Cliffview Assisted Living Center in Kremmling, Colo., on Oct. 13, 2009. She was born March 13, 1919, in Hillrose, Colo., to Raymond and Malva (Wise) Odell. When she was a toddler, her family moved to Denver where Helen attended Skinner Elementary School and graduated from North High School in 1937. During her youth, the family enjoyed coming to Grand County for visits to the Schmuck's Windy Gap Ranch, outside of Granby. During these visits she became acquainted with the Linke family. On Nov. 1, 1941, Helen married Gilbert Walcher. She traveled to California and Mississippi while he was in the Army. While Helen was in California she worked for the USO, publishing a USO newsletter. In 1943 Gilbert was killed in World War II at the Normandy invasion. 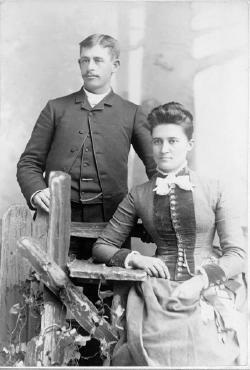 Helen returned to Denver and worked for her father. In 1947 Helen attended Pasadena State College in California for a year. After Gilbert's death, Helen once again joined her family for visits to the Windy Gap Ranch and was re-united with the Linkes. On Feb. 11, 1950, she married William F. "Bud" Linke, her childhood friend, in Casper, Wyo. They moved into their house, a wedding present from her father. They celebrated 59 years of marriage together while keeping the ranch going and raising two children. For 24 years they spent winter months enjoying their second home in Lake Havasu City, Ariz.
For many years Helen was a Sunday school teacher for the Central Assembly Church in Granby and served as the secretary of the Granby Chamber of Commerce. She was well known for riding her motorcycles, beginning with her 1934 Harley and culminating with her Special Edition Honda Goldwing and the many others she owned in between. She was a member of the Motor Maids and would ride to rallies all over the United States. Helen was riding her motorcycle well into her 70s, even riding cross-country. She was a member of Ports of Call and loved to travel. Helen enjoyed Israel, Rome, Turkey, Tahiti, England, and Austria. She also enjoyed gardening and sports. She spent many hours ice-skating, roller-skating, skiing, bowling and fishing. In her latter years one of her greatest joys was her "little dollies," her great-granddaughters. They enjoyed tea parties, playing school, driving the Kawasaki mule around the ranch and rides in Great Grandma's convertible. 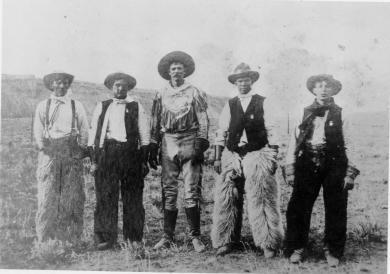 One of the most colorful characters of early Grand County history was Henry "Rooster" Wilson. He was born in Ft. Sill, Oklahoma in 1881 of part Cherokee ancestry. Shortly thereafter the family moved to Ft. Steele, Wyoming. 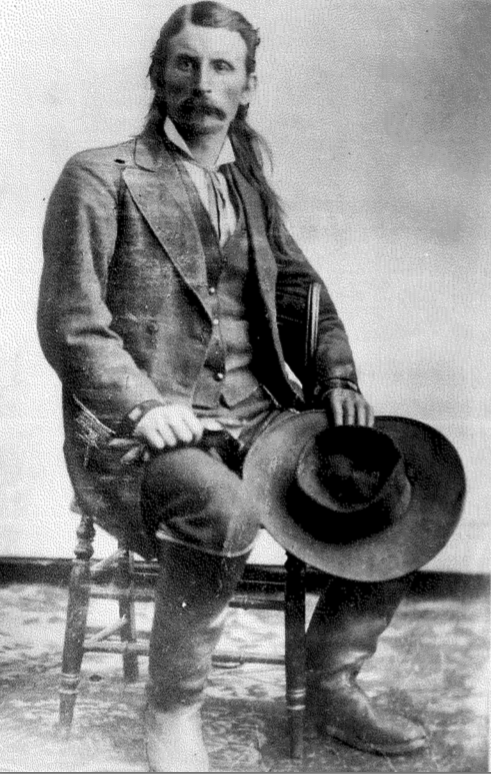 During his younger years he worked as a cowpuncher in Wyoming and Colorado and claimed to be one of Teddy Roosevelt's packers when he hunted out of Glenwood Springs. After moving to Middle Park he became one of the early game wardens for the area. He always rode a white horse and most people thought he chose the color to be conspicuous so he didn't embarrass the local ranchers or his friends by catching them with illegal meat. All his horses and dogs were named "Major". Rooster was one of the best ropers in the area and always helped folks when it was roundup time. He told a story about catching a bear with another fellow. They had two ropes on the bear to keep it away from the horses, but then they couldn't turn loose of the bear, so had to shoot it. He never mastered the operation of automobiles and misjudged one of the turns on the Hot Sulphur Springs/Parshall divide and put his Dodge touring car over the bank. The locals named the place "Dodge Turn" because of so many Dodge cars that seemed to find there way over the bank at that spot. One day Rooster was driving from the Post Office into the yard at the Parshall Hotel for lunch. As he drove into the yard there was a post in his way, so he reared back on the steering wheel and yelled "Whoa". As you might guess the car didn't "whoa" and it ran into the post without much damage. One time he rode into the yard at the McMillan ranch (a.k.a. the Barney Day ranch about 4 miles west of Parshall on the Colorado River) just at supper time. The women had venison frying on the stove. My mother quickly stuck the meat into the oven and brought out some ham to cook. Rooster had supper (in those days visitors were always fed), gossiped awhile and started to leave. As he went out the door, he turned and said, “You can take that meat out of the oven now”, and rode away. His one big fault was alcohol. This was during prohibition, but there was always some available. When my mother knew Rooster was going to be around she had to hide the vanilla and lemon extract because he would sneak into the cupboard and drink them for the alcohol content. Rooster couldn’t talk without swearing, but he was a gentle man and, although he never married, he loved kids. At the local dances he was often put in charge of the babies and younger kids while the parents danced.Rooster liked kids and was often put in charge of the babies and younger children while their parents danced at local parties. How did "Rooster" get his nickname? There are two theories. When he was ready to retire to bed after a full day's work and conversation around the pot-bellied stove, he usually remarked, "Well, I guess I'll go to roost." The other theory was that while he worked as a wrangler, he was the first to get out of bed so he could round up the horses for the other cowpunchers. Then he would roust everybody out of bed at that early hour. Rooster died in 1934 of natural causes and is buried in the Hot Sulphur Springs Cemetery. Colorado was the 38th state admitted to the Union, and is known as the “Centennial State” because of its entrance into the union in 1876, one hundred years after the signing of the Declaration of Independence. The Colorado River was named earlier, and is Spanish for “red“, the color of the water that the Spanish explorers observed. People have been living in Colorado at least 9,000 years. Spanish explorers were here in 1540, but the discovery of gold caused a major population explosion in 1859. The state consists of 3 topographic zones: plains, mountains, and plateaus. The Continental Divide bisects the state, north to south and there are 54 peaks above 14,000 feet. Denver is the State Capitol at 5,280 feet, one mile above sea level. Colorado is noted for its waterways and is the only state in the U.S. from which all water courses flow out of the state. Rivers that have their origins in Colorado include the North Platte, South Platte, Arkansas, Rio Grande, and the Colorado with its headwaters in Grand County. In January 1970, Gerald Groswold, then chairman of the board of Winter Park Ski Area, received a call from the Children's Hospital of Denver about program they'd been running at Arapahoe Basin for amputee children. A-Basin wasn't going to continue the program, and the hospital wanted to bring it to Winter Park. In his morning meeting a few days later, George Engel, who ran Winter Park Ski School at the time, announced that this group was coming up in a week's time and asked for volunteers. Of the 40 or so ski instructors standing there that day, only one raised his hand to volunteer. Later, at lunch, Engel walked by the lone volunteer and threw a note in front of him. "Call this number. You're in charge," Engel said. The 32-year-old Montreal-born ski instructor stared at the note while he finished eating his lunch. He had no way of knowing that by raising his hand he had just shifted the entire course his life as well as the lives of tens of thousands of others. That ski patroller was Hal O'Leary. O'Leary went on to found the National Sports Center for the Disabled. Today, the NSCD is one of the largest outdoor therapeutic recreation agencies in the world. Each year, thousands of children and adults with disabilities take to the ski slopes, mountain trails and golf courses to learn more about sports, and themselves. From the get-go, O'Leary had obstacles to overcome, starting with the fact that he'd never even known an amputee, not to mention seeing one ski. The day after he raised his hand, O'Leary got himself a set of outriggers and went about teaching himself to ski on one leg. Being schooled in the Professional Ski Instructions of America technique, he used all the same concepts as he would use for a conventional skier, sliding between turns. On Jan. 22, 1970, 23 amputee children arrived at Winter Park with equipment borrowed from Children's Hospital. It was a cold day, as O'Leary recalls, and he pushed the kids hard, making them climb up the bunny slope to turn around and practice making runs back down. Some of the kids who had participated in the program at A-Basin had been taught to jump turn the ski rather than sliding it. So they were hopping around like kangaroos, hopping three times to make each turn, O'Leary said. By 11 a.m., kids were collapsed on slope, crying. One screamed: "I hate your guts," O'Leary recalled. Feeling that he had failed them, he took them over to the lift on Practice Slope after lunch and put them on the chairlift. A few bailed out, and O'Leary thought: ?Oh my God, I'm going to kill them,' he said: "I worried they'd end up in the tunnel." By the end of the day, however, the kids were flying down the hill, coats flapping in the wind and smiles on their faces. O'Leary was hooked. For eight weeks the program continued. Before long, the television stations caught wind of what was going on at Winter Park. One day O'Leary got a call from the Today Show, which wanted to feature his program. No sooner had he hung up the phone then it rang again, and Good Morning America was on the line wanting an interview. "It really put Winter Park on the map in those days," he said. As word got out, people with different disabilities started calling O'Leary to set up lessons, from the visually impaired to the paraplegic. For each new challenge a skier presented, O'Leary needed a new adaptation to the traditional ski equipment. He spent nights at the ski shop working on modifications and pouring over medical books. Improving the design of the outrigger was O'Leary's first challenge. O'Leary made a lot of phone calls back and forth with George Engel (who also owned Winter Park Ski Shop) and other product manufactures, explaining the design he needed, then they would build it. Another early invention was the "ski bra." Originally made of metal, the contraption slid over the tip of the skis, holding them in place and preventing them from crossing. "The ski still had freedom, but it helped people that lack lateral control of their bodies," O'Leary said. Sit skis hadn't been invented either. So when a paraplegic wanted to ski, O'Leary modified a cross-country ski item out of Norway. "It reminded me of a little bathtub," he said. "It didn't have any runners. It made me nervous. But, people could use it in a seated position, and it got people who couldn't stand out on the hill." One of the more peculiar adaptive designs that O'Leary saw over the years was a space suit worn by a paraplegic man. The man filled the suit with enough air that he could stand upright, which worked well, O'Leary said, until he sprang a leak and had to be rushed back down the hill. "In 40 years, it's amazing what has happened to the gear," O'Leary said. If equipment is the backbone of the program, volunteers are its heart. "We couldn't do this without our volunteers," O'Leary said. More than 800 people volunteer every year with the NSCD. It's a dedicated group of people - the average volunteer has been involved with the program for more than eight years, O'Leary said. Just about anyone who can ski can volunteer. NSCD provides the training and, soon, the volunteers are teaching the lessons. Thanks to the volunteer program, a NSCD participant in 2010 can get a full day lesson with a private instructor, plus a lift ticket and adaptive equipment for $100. Scholarships help people who can't afford the price tag. Raising money to help offset costs and provide these scholarships is key for the program's success. The NSCD holds more than a dozen fund raisers each year, although the Wells Fargo Cup and the Hal O'Leary Golf Classic are two of the biggest and most well-known. O'Leary built the adaptive skiing program for 10 years before it began to develop into something permanent. 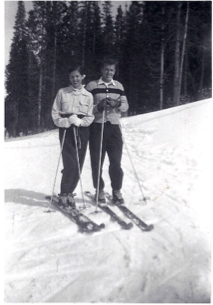 In the early years, he was challenged a lot by the ski area, he said. Lift ops had concern about people riding the chairs with different apparatus. The ski patrol was concerned about people with various abilities getting on slope. "There was opposition from different parts of the mountain," O'Leary said. But the program's champion - Gerry Groswold, who served as the ski area's president for 22 years, from 1974 to 1996 - held strong to his conviction that the mountain should make room for skiers of all abilities, O'Leary said. While the majority of those other ski instructors - the ones that didn't raise their hands that day - moved on to other pursuits, O'Leary had found his life's purpose. "It was seeing smiles on people's faces," he said. "I never realized what it would mean, giving these people movement they did not have in a wheelchair or walking. It changed their life. It helped them in many ways with their challenges. They did better in school. They started focusing more. After several years, wanting to give back what they took, many of them became instructors themselves." For the first four years, O'Leary still had to wait tables in the summer to survive. 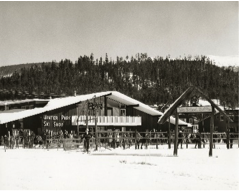 Finally, in 1974, O'Leary parted ways from Winter Park Ski School, and Winter Park Ski Area brought the disabled skier program under its wings with O'Leary at its helm. That year, O'Leary introduced summer activities to the program, including whitewater rafting and horseback riding. "That first summer went extremely well," he said. "The turnout was huge." Today, the summer program has expanded to include almost any recreational activity imaginable, including rock climbing, biking, hiking, canoeing, kayaking, camping and fishing. Programs are designed for individuals, families and groups and are available for all levels of ability, from beginner to advanced. "What we offer now parallels what any tourist would want to do on a vacation in Colorado," O'Leary said. O'Leary has spent the past 14 years traveling to other countries, lecturing, writing books and working with ski areas to set up programs and introduce adaptive equipment. "It's not easy to create a program at a ski area," he said. "Space is limited. You have to raise money to finance it. But the point is to create choices for people who have disabilities, choices like everyone else has." In the United States, the sporting opportunities for disabled people have exploded in the past few decades, thanks, in large part to the early efforts of folks like O'Leary. Disabled Sports USA now recognizes 13 disabled sports programs in Colorado, far more than any other state. Although O'Leary, now 72, handed over the day-to-day operations of NSCD more than eight years ago, he still works daily. He's traveled to 13 different countries helping to create NSCD-style program. He's written the book, literally, on adaptive skiing techniques (Bold Tracks: Skiing for the Disabled). Looking back on that January day 40 years ago when he innocently raised his hand, O'Leary said he'd do it all again: "I've gotten more out of it than I put into it," he said. "I've worked with fabulous people. I've had great opportunities. It's been a good life. It really has." Postal routes into Middle Park were first offered for contract to the lowest bidders in 1875. A once a week route over Rollins Pass was bid at $693 per year but winter was so severe that the service stopped. The route from Georgetown to Hot Sulphur Springs over Berthoud Pass from July through October was more enduring. Later, postmaster appointments were recommended by congressmen, thereby making the the system more variable as political party power shifted at election time. The great advantage to having a post office was the opportunity to include a retail goods for sale, often in the living room of the postmaster's home. Post offices were located within 10 miles of the addresses they served. 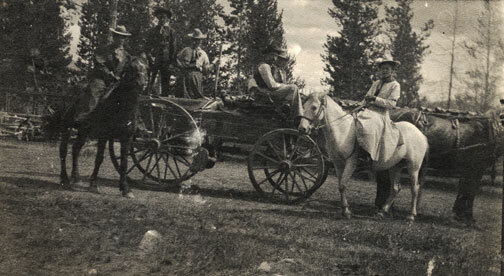 In those days, a 10 mile round trip would often take a full day of travel by horse or wagon. Many post offices were simply ranch homes, and there were frequent changes in location due to disabilities or political party changes. Post offices were closed when there were too few recipients to justify the cost, often caused by consolidation of ranches or mine closures. As transportation became mechanized, there was no longer the need for a 10 mile radius maximum. How did people make a living? 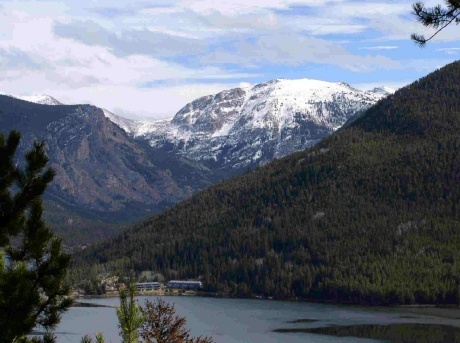 What were some of the businesses and industries that brought people to Grand County? Jut click on the drop-down menus and find out more about it! While natural events occasionally determine history, it is most often the existence of natural resources that lure humans to a region. 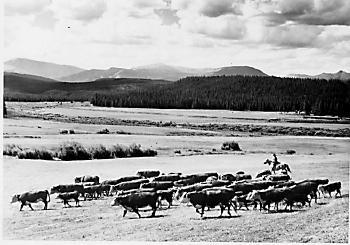 Those who first arrived in Grand County came to mine ore, cut timber and graze cattle and therefore they determined the subsequent history of the region.